From the Asian grocer all the way from Sydney! 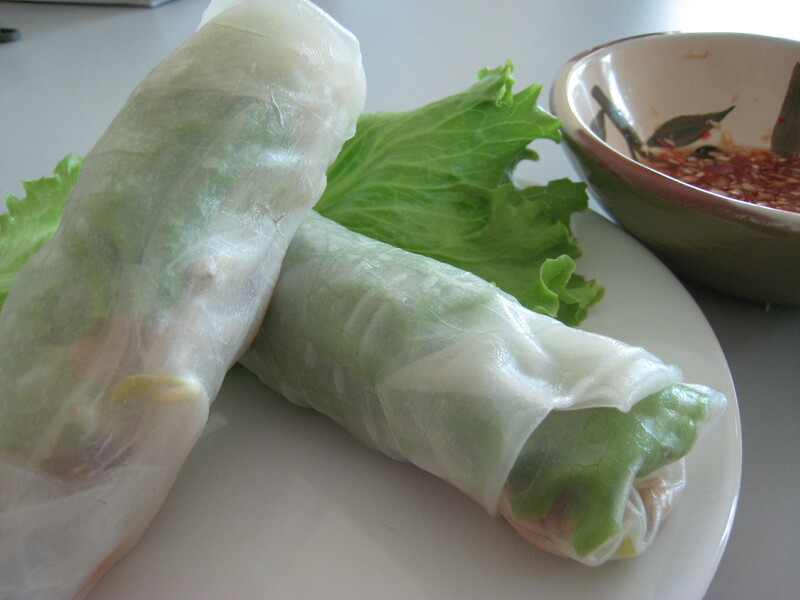 Vietnamese cuisine is very light as they use mostly raw vegetables, or simply cooked in a light spicy and sour sauce. This particular entree type dish is one of my favorite! And easy to make as well. 1 tbsp fish sauce, 2 tbsp lime juice, 2 tbsp water, 1 clove garlic-minced, 1 small red chilli-chopped, 1/2 tsp brown sugar/palm sugar. Combine all ingredients and set aside for at least 15 minutes for flavours to infuse. 3. 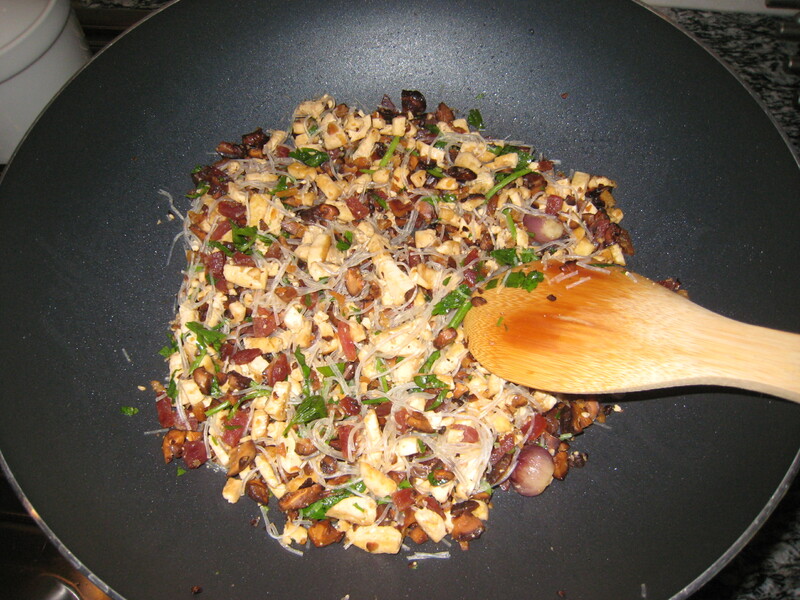 Add in the rest of the ingredients, except peanuts and coriander. Fry for a further 2-3 mins. 7. Place a piece of salad leaf in the middle. Top with some of the meat mixture, and fresh vegetables. 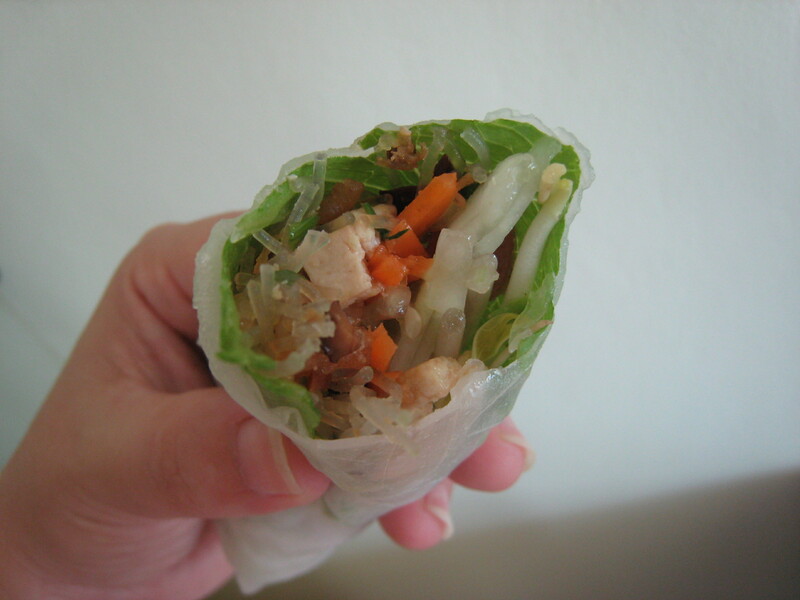 Fold rice paper like how you would fold a spring roll. Yes we are now 7 mths! The THIRD tri-mester! Anyway, as we will be staying put for CNY this year, I thought it might be a good idea to snap a nice face shot of baby during the ultrasound and send it to the in laws together with the CNY card. Unfortunately the little munchkin wasn’t coorperating today and snuggled up to the placenta; probably being annoyed at us for probing her face with the ultrasound scanner. 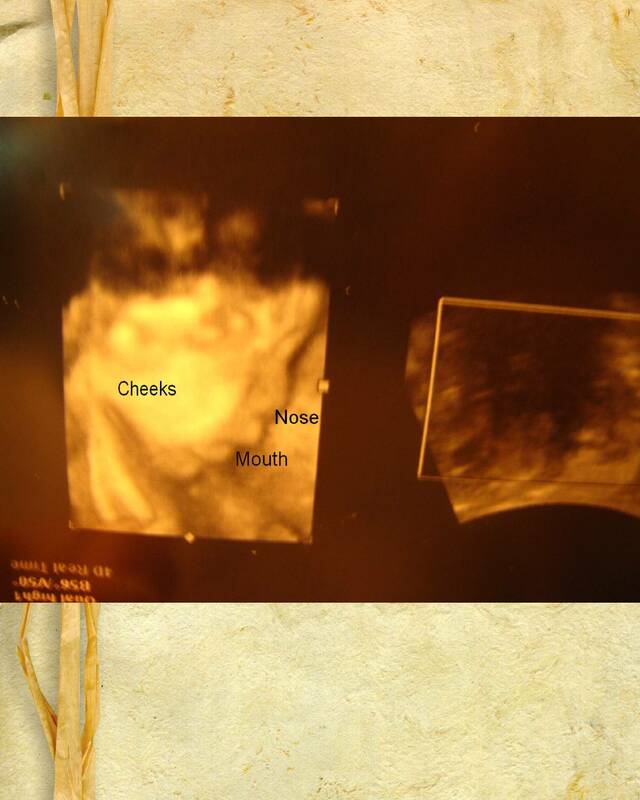 All we managed to get was a side view of her cheeks, nose and mouth; attached here…if you can make it all out. Honestly when I was lying there listening to Hubby and doc excitedly discussing baby’s features and what she was up to…I could not see anything. 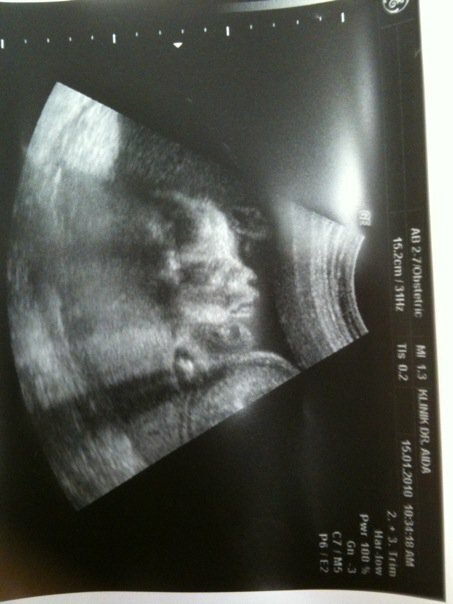 We can now SEE baby wriggling inside through the movements of my belly. 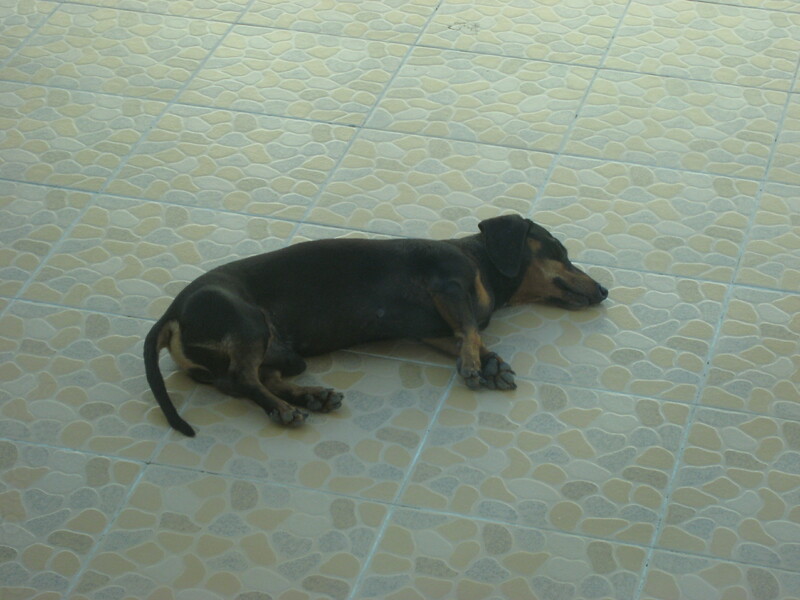 She is getting rather vigorous now, and sometimes a little weird…so much so that her squirming sometimes wakes me up! I must say, I LOVE LOVE LOVE the look of my little belly. I think I am going to actually miss being pregnant, having all these little nudges inside me, it is such a precious experience. But having baby soon in our arms..? Priceless! P/S. I am addicted to popcorn! I would like to start by saying, that I did not snap a pic of this before Hubby and myself both wolfed it all up for dinner. It was supposed to be just a side dish for dinner tonight. After all, I did not expect Hubby to even like it! I was thinking this was just going to be another one of the weird local dish that I fancied that he did not. I was wrong..
Nasi ulam or loosely translated into ‘rice with herbs’ was something I just grew up with. It is simply finely chopped fresh local herbs, some finely chopped french beans, finely chopped lemongrass and pounded fried salted fish – all mixed together and eaten with plain white rice. 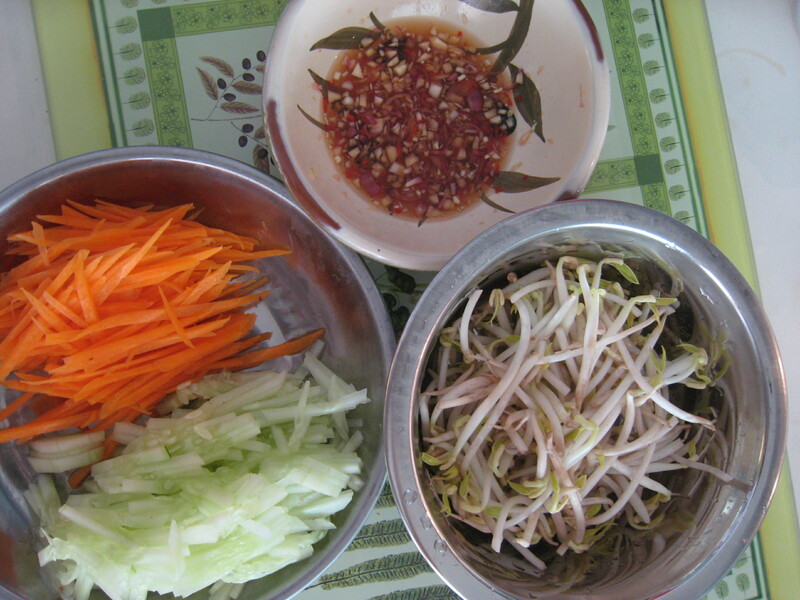 Some varieties include adding kerisek (grated coconut fried dry), chilli flakes for a bit of spicy kick and for the Thai variation, a certain black watery sauce made with a blend of fish sauce and some other stuff. One can also add grounded toasted peanuts if desired. In the spur of the moment earlier this evening, I decided to pick some of the kaduk leaves and basil from our herb garden. I had some left-over french beans (you can indeed use other similar vege if you like) and lemongrass in the fridge – so scalded those with boiling water for a split second just to get the raw greeny taste away. The kaduk and basil must be chopped very finely, together with all the other stuff. I also added some salted fish meat, which I fried briefly in very little oil till crisp and then pounded to till fine. Next, mix everything together with some chilli flakes and thereafter toss the fragrant greeny mixture into steaming hot fluffy white rice and let the aroma infuse. Like I mentioned, LOVE IT!!! Now I do not have to beg Mum to ta-pau this from home anymore…! 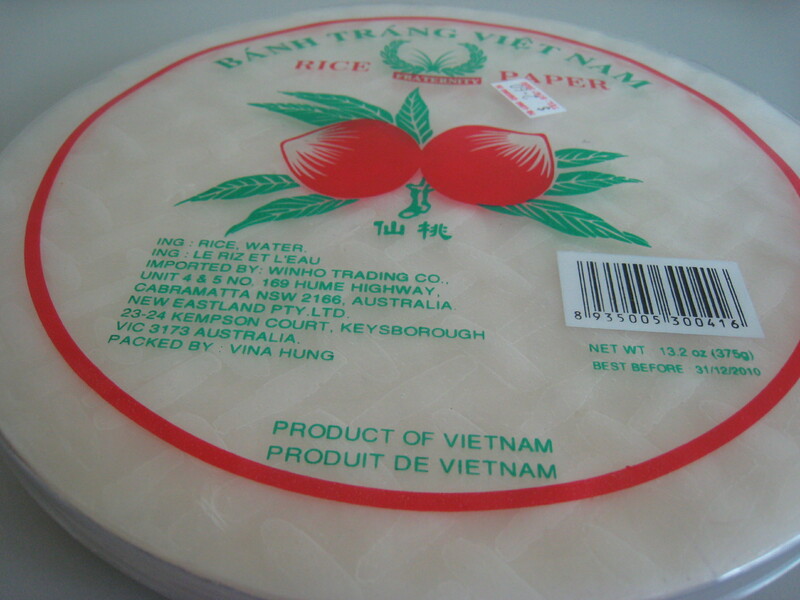 For those of you who’ve never tasted this, I borrowed a pic from the web attached below. I have to admit, it is an acquired taste…the herbs do have a strong taste because they are eaten raw. 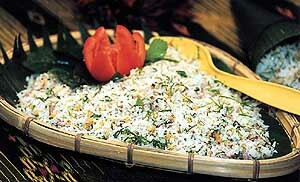 Nasi Ulam; courtesy of http://kuali.com/recipes/viewrecipe.asp?r=611 . We can now literally watch baby’s movements – from the erratic movements of my belly, of course. A few weeks back, there were 2-3 days when baby just decided to remain quiet and relatively sluggish that it made me worried sick and turned into some semi-psychotic mum-to-be who searched for any articles online, in books on that particular subject, and not forgetting checking and re-checking with other mums. In the end, I decided to make an extra appointment with Dr Aida, requesting her for a brief check-up to see if baby was doing alright. Of course come the morning of the check-up baby suddenly decide to wake up from her slumber and started moving rapidly again. 🙂 So all is well….PHEW!!! Thank YOU! Since then, baby’s movements have intensified and even causing a slight discomfort. She’s now moving ALL THE TIME. Like she’s never sleeping at all. Oh my… I wonder if this reflects how she will be when she comes out….but well, for now I am not complaining. As long as I feel a nudge here, a vibration there and punches everywhere…at least I know she is active and happy and alright. We were also in KL for a brief visit to attend Petrina’s (a very close friend) wedding and while there over the weekend, Dr Aida suggested we pay a visit to a fetal heart specialist to have a look at baby’s tiny little heart, reason being I do have a minor PDA in mine and she wanted to see if everything is fine with baby at the moment. Thankfully, baby is 100% dandy! To quote the good doctor’s words, he was “very happy” with how baby looks now. Oh the joy of hearing those reassuring words! Baby baby baby…. we cannot wait to see you soon ! I am so pleased with my herb stash today. Went by a friend’s house to pick up a basil plant, but in the end came back with lemongrass, sireh, ulam raja, green tea, kesum and 3 types of chillies. All of which will come in handy during the post-natal period later. Splendid. Not to mention, in a few weeks’ time after they’ve grown nice and well, I can pretty much walk to our backyard and pluck herbs for cooking…anytime. That is is what I really feel like saying to the next door kids right now! I have been noticing empty drinks cans and boxes scattered occasionally on the lawn along my side our share fence for quite some time now. Initially I thought perhaps those were from the contractors who were working either at our place or theirs (still unforgiveable but I will close one eye since I thought that was only short term) but then after everything else settled down…. the cans/boxes still started to appear from time to time. I have been keeping mum about for a while because I still gave them the benefit of the doubt… but today there it was again! Another empty can on our lawn, and this time I am VERY FRIKKIN SURE it did not come from anywhere else but THEIR side. I picked it up and chucked it into the bin this time, but next time….hmmm…next time I am going to stick a note on the can/box and sarcastic write a “Please refrain from throwing your rubbish into our garden” blah blah and throw it back. We ushered in the new year with some home style goodness today. 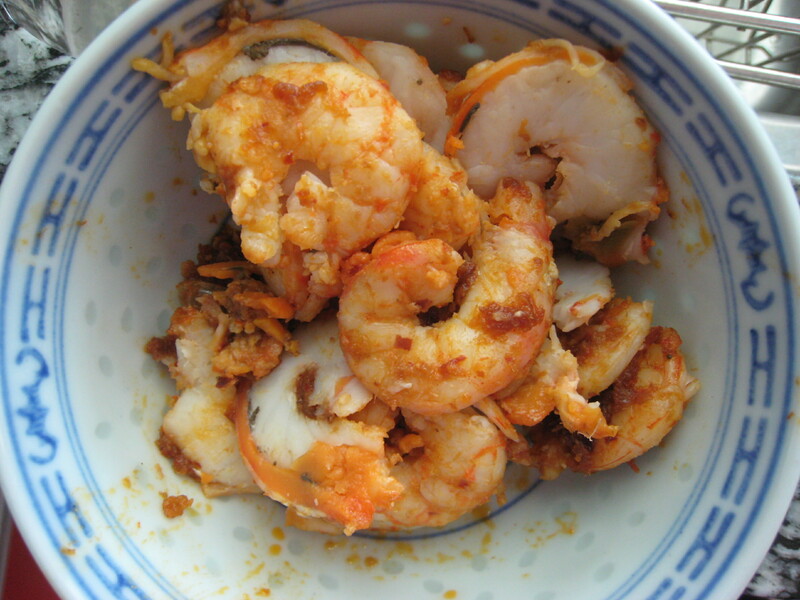 Hubby loves his hometown hawker fare, so since the Aunty who used to sell Hokkien Mee in Miri decided to close shop some time ago, I thought why not cook this for lunch today. After all, it is a public holiday and I have some time on my hands. 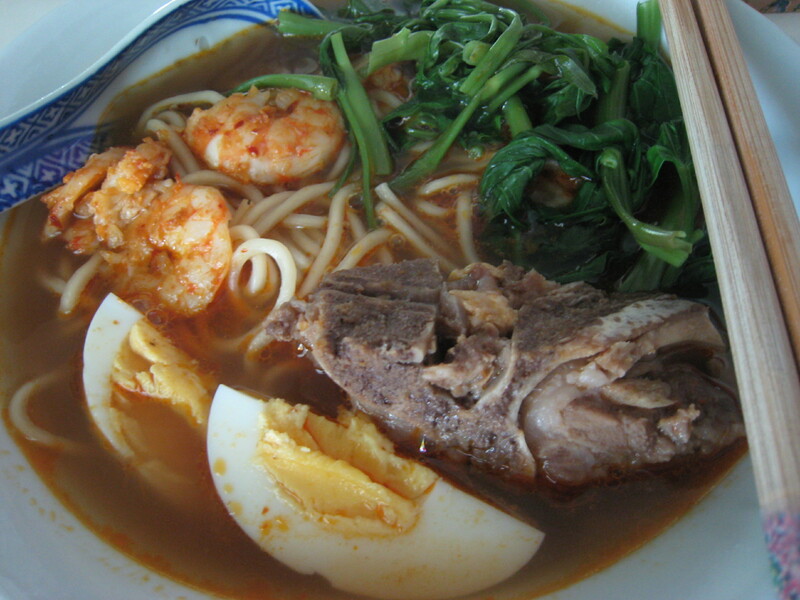 The most important aspect of any noodle soup dish is, of course…the soup. So a well-prepared stock is most important for this dish. I found some real fresh prawns on NYE while grocery shopping, bought some and discovered I still have some pork ribs left in the freezer. 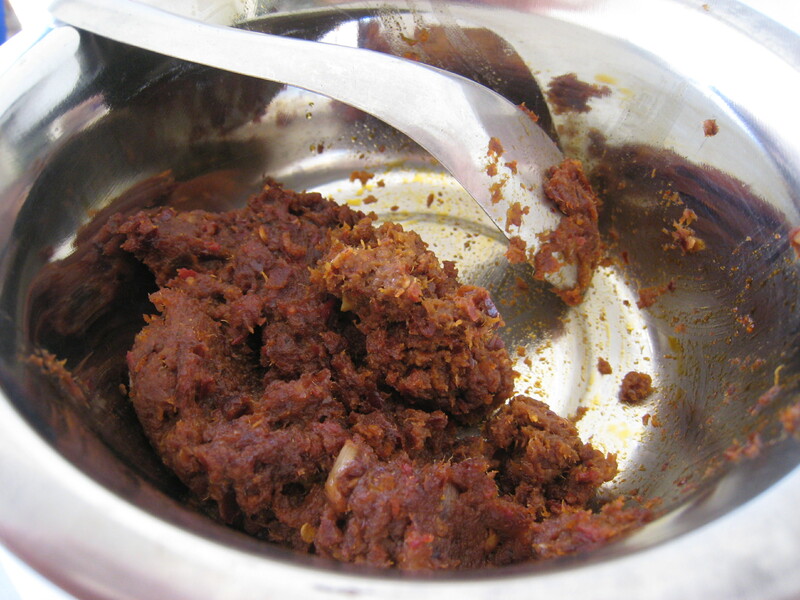 Mum did give me a basic recipe for this some time ago but I forgot the stuff that goes into the chilli paste, so a quick check via Google returned this site and I give it two thumbs up for authenticity. So really, I have to thank that food blogger too for kindly posting her recipe online. 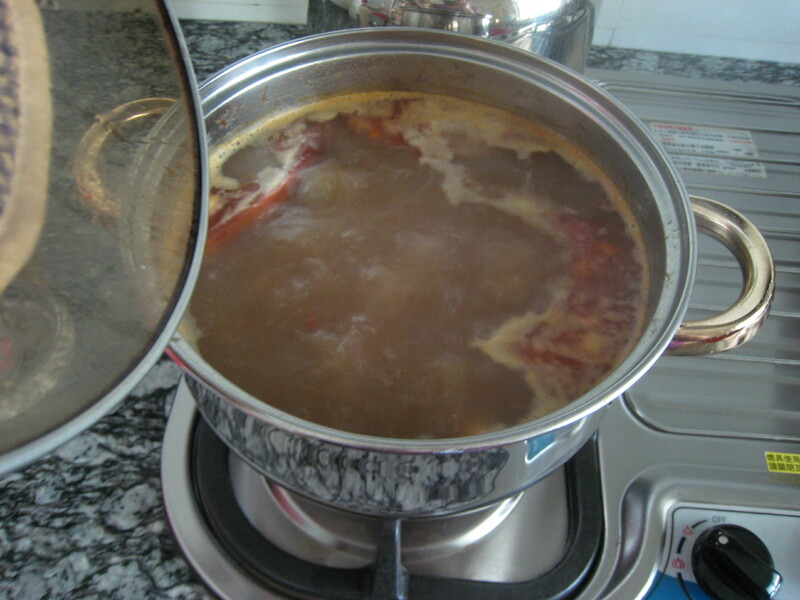 I boil the soup for a few hours until the water reduced by about 2-3 cups...it is all about the stock baby! 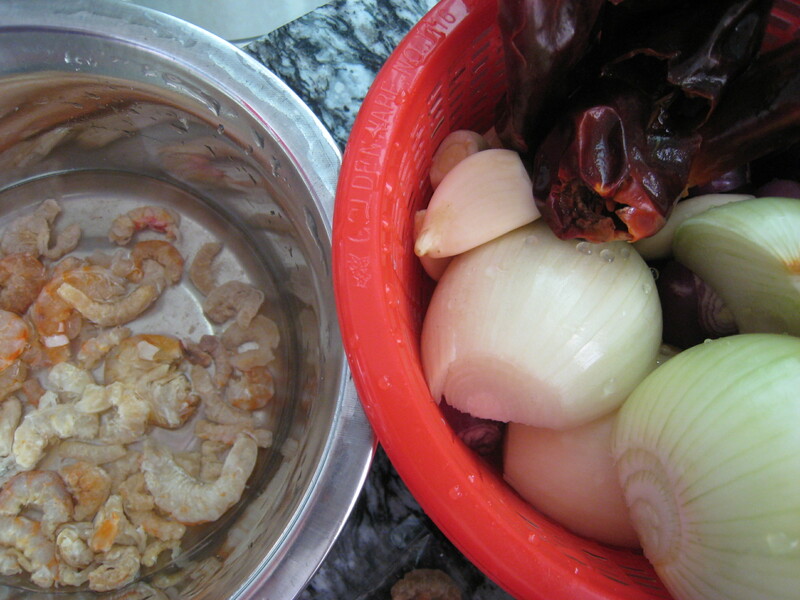 Abovementioned food blogger suggested frying the prawns in some of the chilli paste as well. Tried it and quite yummy! For recipe, you may simply refer to here…. it’s mostly similar….you know me, I don’t cook with measurements….everything is agak-agak so I cannot really list down a good ingredient list. Hubby calls me a Frankenstein cook.. because he says I just put anything I can find together and somehow they work…hmmm….